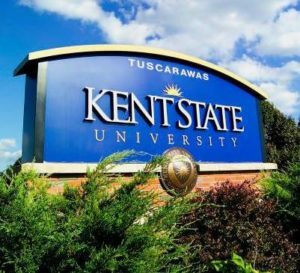 Nick McWilliams Reporting – New Philadelphia, Ohio: The new entranceway to the Kent State Tuscarawas campus is nearing completion. Designed to ease traffic congestion when classes let out, especially at the same time as Buckeye Career Center down the road, the new path helps address recent growth of the regional campus. While there are more steps to be taken before opening such as landscaping, a few signs, and some painting, Dean Dr. Bradley Bielski says the unveiling has been held back by one problem. Even with inclement weather working against them, the university is aiming to open in late March or early April. The next phase is expected to begin soon, which involves housing for students who reside far from campus and other academic buildings, among other improvements. The first phase of the project was funded by local money and donations.